Firstly, I’m just going to put this out there: I don’t feel guilty for being a preemie mum. 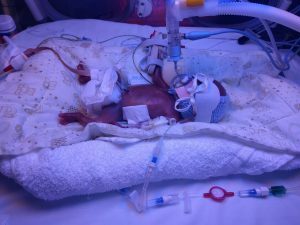 One thing I hear a lot from fellow preemie mums is that they feel guilty for having a premature baby. Guilt for their bodies failing them and not being able to keep the babies safely inside them until term. I don’t feel that way and maybe that makes me a little weird! I sometimes feel like my brain is wired differently to most people, and wonder if I’m slightly on the autistic spectrum (okay as a former teacher I can recognise that I’m definitely on there!). I see things a little more black and white sometimes. When I was pregnant I followed all the advice given and looked after my body, and in that final week of pregnancy when my body was feeling tired, I listened to it, I took things easy and put my feet up. 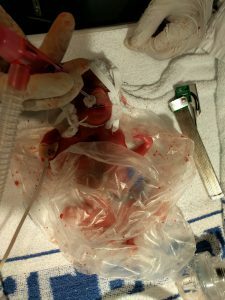 On Christmas Day, the day before going into labour, I had everyone waiting on me so I barely had to move all day, so from my point of view, I consciously did nothing wrong and therefore in my black and white mind I have done nothing for which to feel guilty; regarding the premature labour at least. That said, there are two things for which guilt does rear its ugly head and they both surround the loss of my son, Archie. 1. Why couldn’t he just stay in there? After giving birth to Henry the labour appeared to stop and I was given medication to start the contractions again so Archie could be delivered, at the time the thought went through my head: “why can’t he just stay in there for a bit longer?” I never voiced this at the time and that I regret. I’ve since read stories of twins being born days or even weeks apart and I often wonder why that option wasn’t presented to me. In reality I’m sure there was a good reason, the medical team probably knew something I didn’t and it’s not my place to question their expertise, but I can’t help wonder . . . what if? 2. Just a little more time . . . The other thing I feel guilty about is the lack of time spent with Archie before he gained his wings. The first day was spent in a blur while the babies were stabilised and whisked off by neonatal ambulances to a hospital with a NICU where I was admitted shortly afterwards. When my husband and I arrived we briefly visited the babies, all was well so my husband went home and I got settled in the ward and proceeded with my lesson in hand expressing milk. I visited the babies later while delivering the milk to check they were okay and then retreated back to the ward where I fell asleep until 3am when it was time to express once again. Diligently I delivered my next syringe of milk and handed it to Archie’s nurse. I don’t really remember anything of these two visits except the fact they were both stable. I spent the whole night at the hospital and only spent a few minutes with each baby. Why didn’t I sit with each of them? Talk to them? Read to them? Why did I trot back to the ward in ignorant bliss? Sure, I was exhausted after 36 hours of no sleep but surely i could have spent an hour or so with them on their first night in the world. In truth I can barely remember anything about that night, the only reason I knew I handed the milk to Archie’s nurse was because she told me later. I hate that my memories of the first day are so fragmented. Maybe I was just too tired to think but I will always carry around this little piece of guilt for not spending more time with my sons on the night before they even had names, on the night that turned out to be Archie’s first and last night on earth. From the next day onward I kept a diary so I would not forget any more parts of the journey but most of that first day and night will seemingly be forever lost somewhere in the depths of my mind. The night we lost Archie changed me; I couldn’t get the time back with Archie but from that moment on I was not going to miss any time with Henry and I made sure I was there by his side as much as I possibly could and despite that it still did not feel like enough.